I've heard the 'cliff dive' in Dauis bounced off a few times but it was just an idea until Jeffrey invited me to tag along. I'm not really a cliff diver but I don't mind trying. 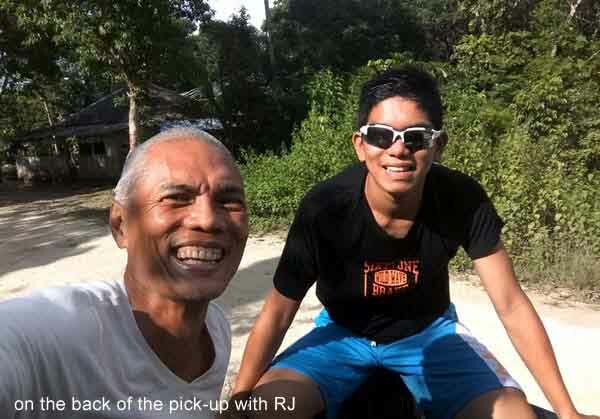 Together with JR, the 3 of us headed out to Dauis not just for a cliff dive but also for snorkeling and freediving. We brought our dive gears with us plus my 20m nylon rope and my 30L drybag to act as floatation device to anchor the rope to (more like a nylon string really). We entered into Molave Resort for a P30 entrance fee. It's a daytime beach resort with shaded nipa huts and picnic tables mostly for locals (it's by the water, but no beach). They have a concrete diving platform that lands you in the water below. The jump is about 20 feet and the water below is perhaps 15ft deep. No, we didn't do a jump. 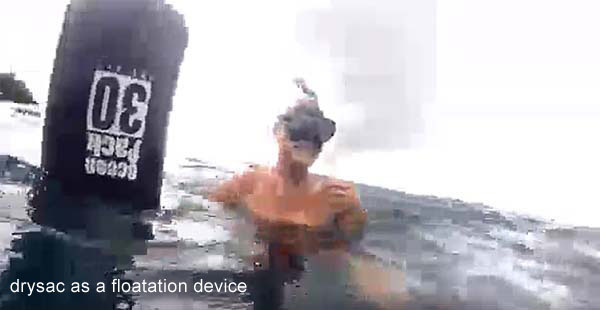 Instead, we went down the concrete steps and into the water for snorkeling. The entire time, I thought the sardine bowl was exclusive to Moalboal, Cebu. But here in Dauis, the sardines by the tens of thousands are just by the shallows on the coral reef where the cliff diver lands. They open up whenever we dive into their bowl. I'm surprised that there is no tourism effort to highlight this feature. 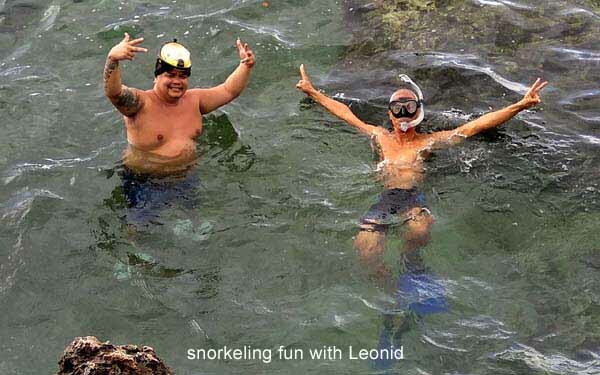 People come from near and far to swim with the sardines of Moalboal, dangerously competing against pumpboats for space. But here in Dauis, it's all for ourselves! Just a short distance away is the drop-off where the deep blue begins - you don't see the bottom! 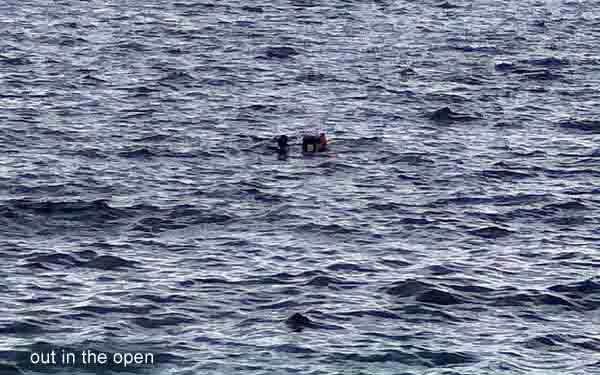 From the surface, I could see scuba divers along the wall. 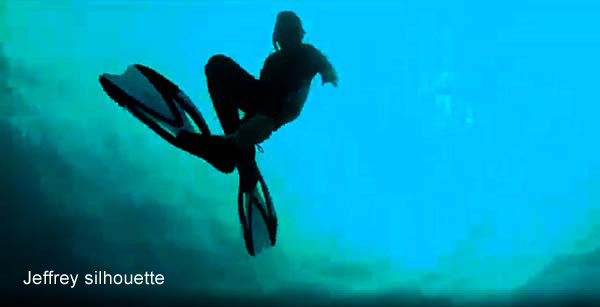 I did a little freediving along the vertical wall and the coral wall is intense with marine life - plants and fishes. A school of Jacks are visible. 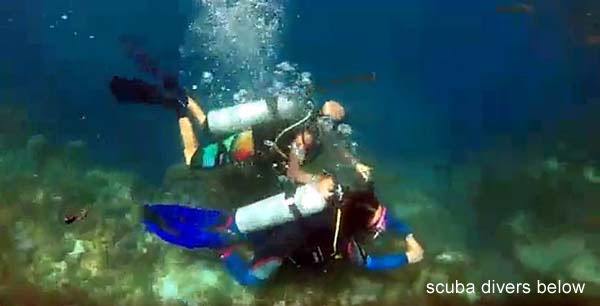 The wall is no different from the dive wall of Apo Island, Pescador Island or Balicasag. 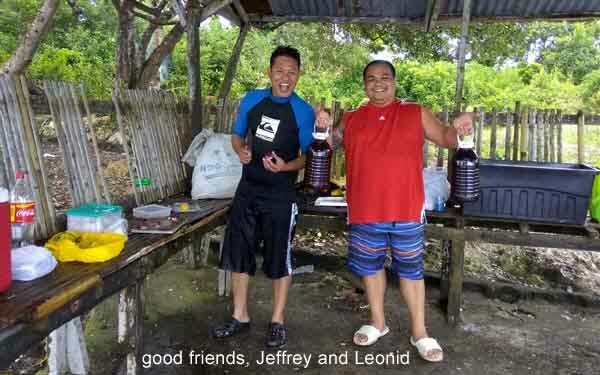 Jeffrey's friends, Leonid & co, were just adjacent to Molave Resort, on an undeveloped section of the coastal strip frequented by locals. 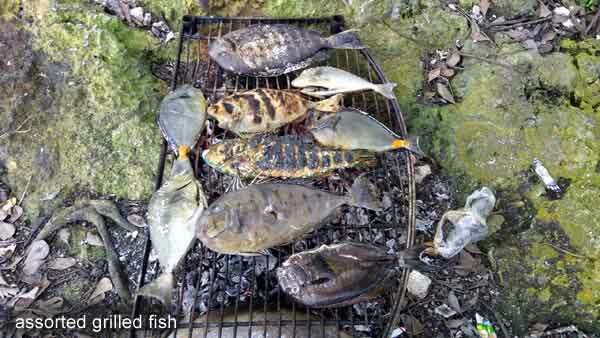 We joined them later and feasted on grilled and kinilaw fish washed down by bahalina. We also assisted a fisherman with his net. 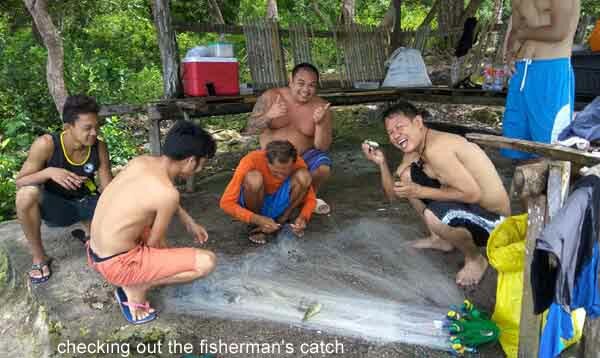 He had a modest catch of rock fish - hardly a kilo for all that work. After feasting on the fish, Jeffrey and I setup the 20m rope with the drybag on the dive wall. 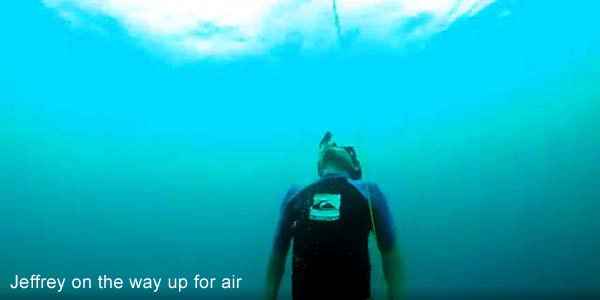 We tied-up the running line onto a heavy rock and took turns freediving. Jeffrey reached down to his new record - 15m! I had difficulty equalizing and consequently stopped trying after a few unsuccessful attempts. But seeing the wall at a deeper level revealed more of its marine diversity. It was a different kind of fun as we usually do saddle time together. 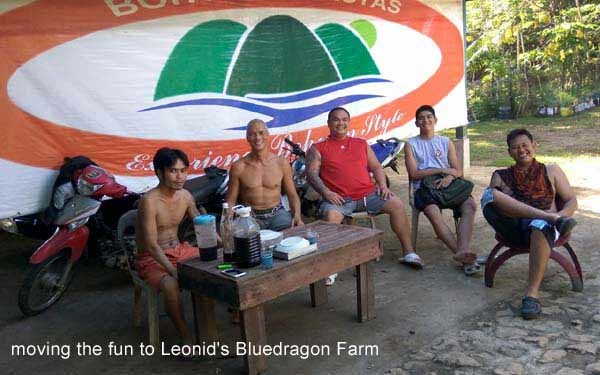 The group later on decided to continue our hang at Leonid's place - a working farm near the proposed airport with ample space for expansion. There was more bahalina than we could finish. There was good talk, good bantering and good bonding. Half tipsy, we headed back home. 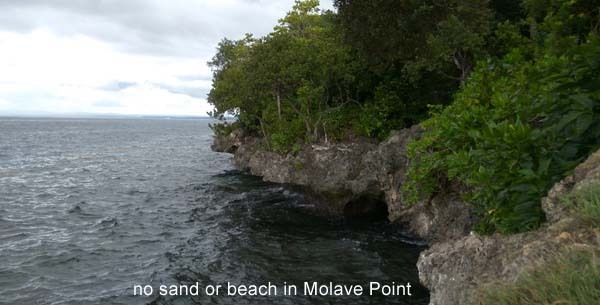 Molave Point is perhaps a best kept secret in Dauis despite not having a beach. No need to go far from Tagbilaran. 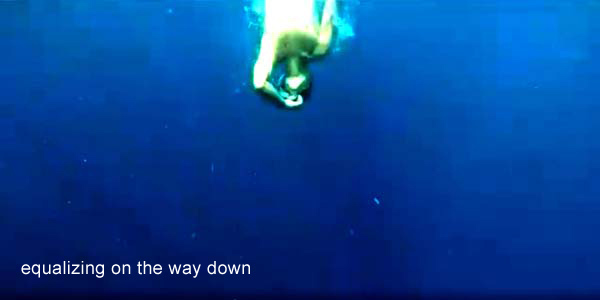 Molave has a sudden and deep drop-off you just see a deep blue - perfect for scuba diving and freediving. 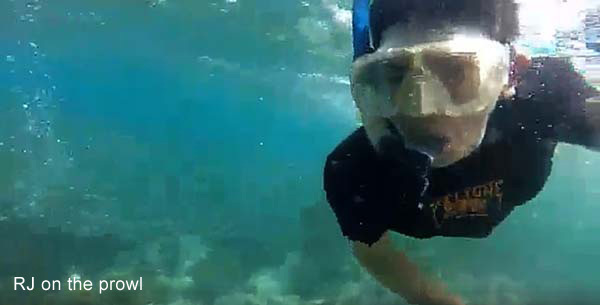 The shallows offer an animated coral scene for snorkelers. To top all of that, you have the sardine bowl right smack where you do a cliff dive. What more could you ask for? Jeffrey, thank you for taking me along your magical adventures!